Marta Szlubowska, (Poland), on violin, Alejandro Encinas (Peru), on viola and Taylis Fernandes (Cuba), on cello, are the members of the only professional string trio in Mississippi, called the Mississippi Fine Arts String Trio. These three very accomplished artists came to the United States full of great hopes. They knew they could have more opportunities here then in their native countries. They consider themselves very lucky to have come and stayed in the USA. Their mission as a trio is not only to perform in the US, but to travel to their homelands to share their music, teach, and often bring young musicians back to let them experience first – hand, “The land of opportunities”, just like they did themselves. MFAST has so far traveled together to Colombia, Peru and Chile, where they performed as soloists and chamber musicians, taught masterclasses, lead orchestras, and generally have been the inspiration and hope for many talented and eager young artists. The MFAST’s repertoire is quite varied and original. In addition to the traditional works by European masters, they perform works by South American composers such as Piazzolla and D’Rivera. 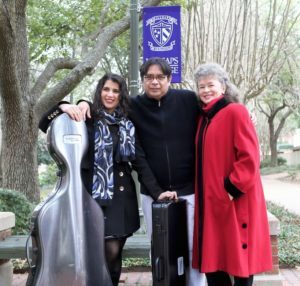 The Mississippi Fine Arts String Trio is the Ensemble-in-Residence at Millsaps College in Jackson, Mississippi. To learn more about The Millsaps College Department of Music, please go to http://www.millsaps.edu/academics/music.php. You can read the individual artists’ bios below. To learn more about Alex Encinas’s Mississippi string education projects, please go to www.msorchestra.com and click on “Community and Education”.